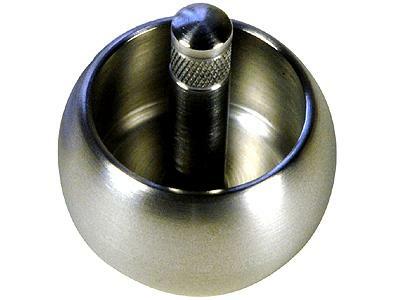 The Tippe Top consists of a slightly flattened sphere, with a metal stem. It looks slightly like a small mushroom!If you spin the top, it starts to slide and tip over. If you spin it fast enough, it will turn completely upside down, spinning on its stem.This strange piece of physics was discovered by the German physicist Helen Sperle in 1891. There are very cheap versions around, made of plastic, but this designer version is made of aluminium, and comes in an elegant foam surround with a cardboard sleeve. The top is about 35mm high, and the designer and maker of the top is - appropriately enough - German. Great little item spins very well love the science as to why it flips over would recommend. Aluminum, so not as absolutely perfect as some higher quality metals, but the price! A real steal. It's the best thing going for this classic, very interesting top. It works just as good as any other. Turns over just as advertised. Excellent craftmanship. Made with heart and soul. Well crafted and well presented.